1. THIS incredibly sweet story about a neighbor who went above and beyond for his canine pal next door. These types of stories warm my heart, especially in the current climate of our world. 2. The Livi Studs from the new Kendra Scott collection. Oh man, are these pretty!! They totally remind me of a shark's jaw and they look so great on! They come in three different metals (I have rose gold) and are a total conversation piece! 3. 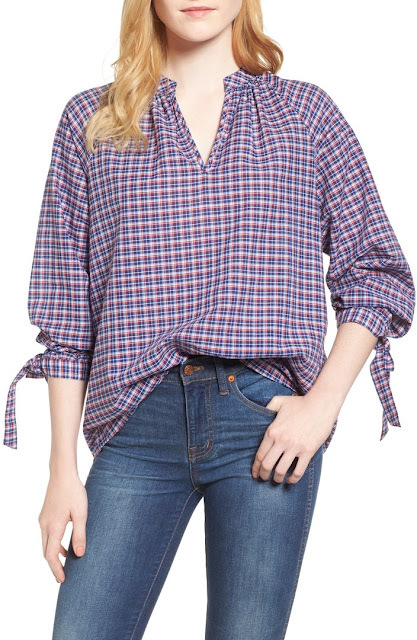 THIS super cute top by Madewell, which is on major sale (and an additional 30% off with code DREAMBIG) I am new to Madewell, and only have two pieces, but am so darn impressed by the quality!! I am just about to order that cute top (how cute would it be with white jeans, and THESE shoes I'm also obsessed with) for a Sunday brunch? !